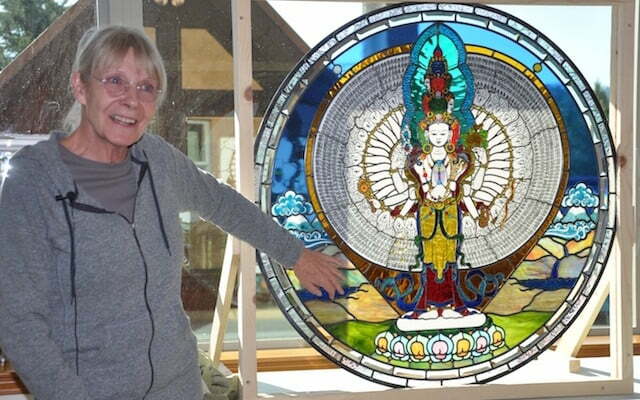 Bev is a long time practitioner and the creator of the stunning circular stained glass windows in Gotami Hall and Chenrezig Hall. It started sometime last year, this creeping sensation that I was being overtaken by things…my things. I was overwhelmed and stuck. Then I found a book that helped me. Marie Kondo’s The Life Changing Magic of Tidying Up . Basically, she tells us to pick up every object in our possession and hold it to our heart. Does it spark joy? If not, get rid of it. Sounds simple and actually it is…but it takes a LOT of time when your objects have reached a state of critical mass. I am an artist. My studio had become so clogged with things that I couldn’t find any one particular thing. So I donated boxes of art supplies to a local high school art department. I gave finished pieces of art to friends who will cherish them. I spent days sorting out nuts and bolts and bought an organizer to keep them in. A new tool chest stores hand tools, each drawer neatly labeled. I began to look around and noticed that this was happening all over my house in closets and cupboards and drawers. I even have a barn full of stuff that can’t fit in my house! When objects are seen from this perspective it can become overwhelming. However, I have persevered and I can tell you it actually IS life changing. An interesting side effect of “tidying up” is the feelings this process unearths. Sadness, sorrow, guilt, and shame just to name a few. These negative feelings were sparked by the realization that I have been hoarding things for years, things other people might have found useful. And what did that say about me as a person? Am I that insecure that I need all this stuff to make me feel worthy? When I was considering getting rid of my library I was talking it over with a friend. She asked why I thought I needed hundreds of books; books that I had already read and most likely would not read again, or books that I bought and have never read and probably never would read. I said well how will anyone know what I’m interested in, i.e. who I am. Maybe just by getting to know me? No hiding from this realization! I donated my books to a local library. If I want to read one of them I know where it is. In all fairness, I have also experienced feelings of joy, love, happiness and compassion. The positive feelings came from remembering joyful moments with friends and family that I had forgotten about. Minimizing my possessions also generated true feelings of compassion for the executor of my estate. As far as my Buddhist practice is concerned, I can see how letting go of stuff is practice for letting go of self-centered thought, for letting go of this body, for letting go of this life. I still have a long way to go but I am firmly on the path of liberating my stuff.